Tied for first “New Trend” comic at E.C. Crypt 17 always has and likely always will be considered one of the top EC books to own. Another comic that could fit on multiple lists, be it PCH, Crime, Golden Age Classic Covers and more. Without a doubt, one of the toughest to find and most expensive books on this list. One of the “in between” titles for EC and the 1st appearance of the Old Witch as well as the Vault of Horror. 1st Appearance of the Crypt Keeper and 1st issue of one of the many “in between” titles that EC was spitting out in an attempt to morph into this “New Trend” companies. CLASSIC. Plain and simple. The fans know and the fans want. Unfortunately the fans are also willing to pay up for this and there always seems to be just a bit too much competition for this book. One of the earlier releases on the list. Though it is one of the definitive “Classic Covers” in all of comics, a lot will argue that this is certainly not a PCH cover, but it gets lumped in so often, I am doing the same. 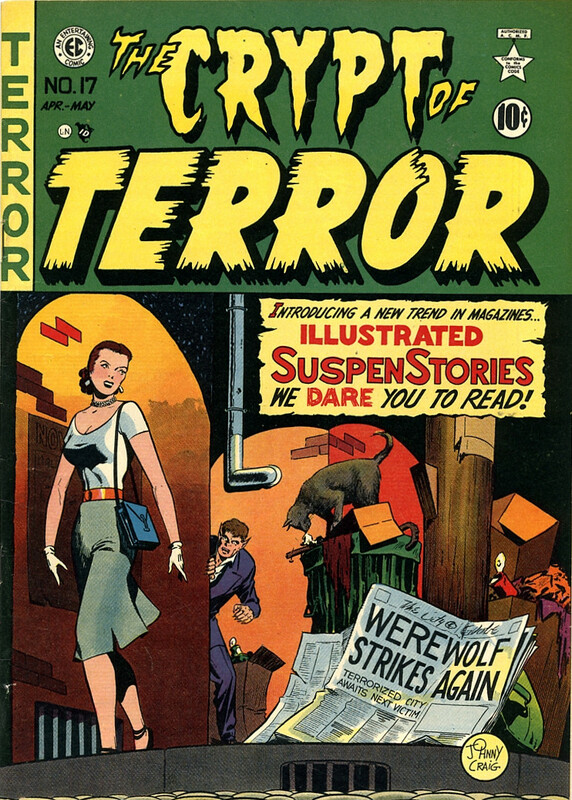 With a publishing date of January of 1947, this is considered by most to be the first horror comic book. OSPG even goes as far as to list it as the most expensive horror comic. While a great book and extremely important to the true PCH fan, there are still a couple books that made it higher on the list. The king of the hill, the big daddy, Black Cat Mystery #50. Again, I went with this cover based on awareness alone. Not to take anything away from this visual masterpiece penciled and inked by Lee Elias. While copies are still surfacing and making their way through different collector hands, the price is consistently rising, and probably will continue for coming decades. That’s all I got folks. For those of you who managed to read through the quagmire of personal opinion, random stats and ramblings; I thank you. For those who skimmed over pictures so they could get to the bottom and tell me what I missed and what I did wrong… I don’t blame you. Thanks for all of your hard work for this series. Really great stuff! Being a fan of horror movies I absolutely love these covers. I hope to find any in the wild but pretty tough. Incredible Ben. This is perfect info for a guy like me who knows very little about what to buy when it comes to PCH. Amazing list. I have 2 of these which is crazy! Weird Mysteries is a tough find but I’ll nab it one day. Great job as per usual Ben! Great list, BC50 is the king. One cover I always liked was Black Magic #28. A creepy Jack Kirby zombie cover where there was an eye transplant from a recently deceased guy who came back from the dead because he wanted his eyes back! Lol! Great stuff! Rumors on the upgrade are true! What you guys got for me?? There’s a top 100 Variants. Why not a top 100 PCH list? There’s plenty of covers to do one.